From the air, it looks like a child’s snow angel. From street level it is surprising delicate, with its pleated roof and many stained glass windows that belie the massive concrete and steel construction. Rock Island’s St. Pius X Catholic church, shown on today’s postcard from Shannon Hall, is located at 24th Street and 31st Avenue. And now that it’s 50 years old, it can officially be considered as historically significant for its outstanding architecture. The history of the church goes back to 1948 when Bishop Schlarman of Peoria purchased 7 ½ acres at this site for a future church to serve the growing hilltop population. The parish, which was not established until 1955, covered the area between 18th Avenue and the Rock River on the north and south, Moline on the east, and 12th Street on the west. Rev. Edward Farrell was named the first pastor but retired in ill health soon after. The new church adopted St. Pius X, a turn of the century pope, as their patron saint. He had been canonized only a year earlier in 1954, forty years after his death. The land already had a building on it, a warehouse previously used by the Scheuerman Construction Company. Scheuerman and Kemp was a development company that built many subdivisions throughout Rock Island in the forties and fifties. The first church services were held in the original warehouse on June 19, 1955 under a leaky roof and with sparrows flying overhead. But it didn’t matter. The parishioners donated much of the labor to create a usable church in the building. The first new construction occurred in 1957 with a convent designed by Ed Lerch for the teaching nuns from Ottumwa Heights, and an 8-room school designed by William Bernbrock. The next year, a rectory was built and, in 1959, the school was expanded by four rooms and a basement hall. Meanwhile, the congregation worshipped in the converted warehouse. But that would soon change. Architect Italo “Lo” Milani relayed the story of how this magnificent church came to be. When pastor Msgr. 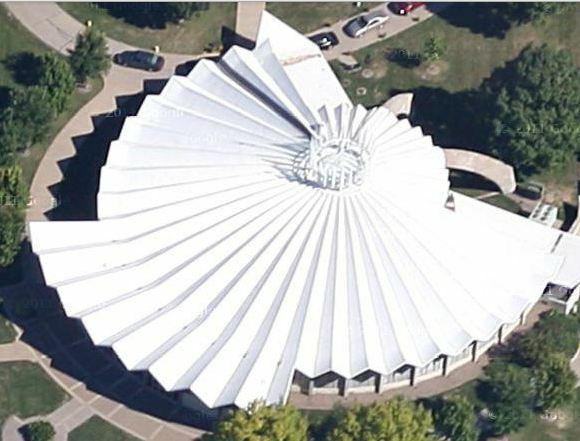 Jordan first retained architect Ed Lerch to design a new church, a traditional style was the result. In reviewing the drawings, a diocesan consultant specializing in art and architecture suggested that it was an opportunity to build a church that reflected contemporary style rather than be a derivative of centuries-old models. Msgr. Jordan left it up to the congregation to decide. Their choice? Modern. Mr. Lerch brought in architect Rudolph Sandberg, who was well known for his structural concrete designs, and the church we see today was the collaborative result. T. W. Arnold also contributed to the project and Mr. Milani would design the altar screen and the small chapels. 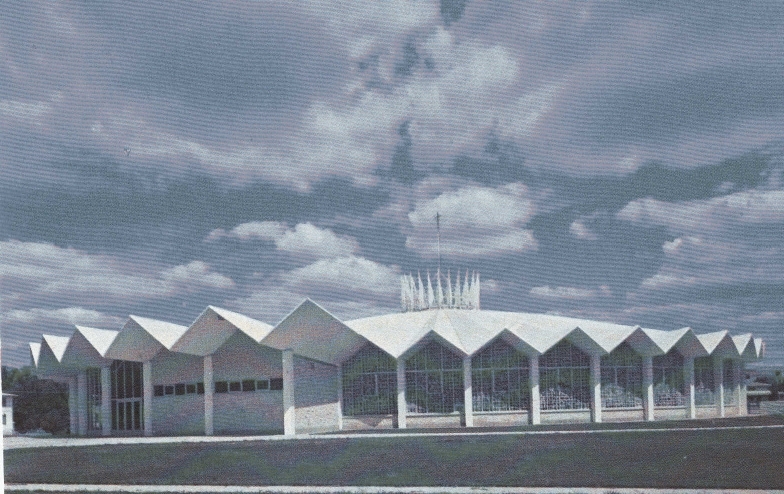 On October 13, 1963, the cornerstone was laid, and seven months later, the church was dedicated. Despite its use of modern materials — steel, concrete, chunk glass — and its lack of many traditional church elements — Gothic windows, steeples, interior columns — St. Pius X is still readily identifiable as a church. The roof is solid concrete, formed into a folded plate design. It is supported at the edges and cantilevered over the main entrance. According to Mr. Milani, the concrete was originally coated with Hypalon, but it leaked and was soon replaced with roll roofing. More recently the roof was covered with waterproof rubber. A golden cross is elevated above the painted steel crown in the center of the roof that can be illuminated at night. The stained glass windows from Chartres, France, are outstanding. Those in the front of the church are traditional art glass joined by metal “cames.” However the other windows are made of 3/4 inch thick slabs of glass, also called “dalle de verre,” that is set into concrete. The 18 larger windows are pictorial while another 20 smaller ones have an abstract design. The interior of the church, with walls 160 feet apart, incorporates fine materials into the design. The pews of white Appalachian oak seat 1100 in a 270 degree arc. Exquisite masonry is used throughout including the altar of Colorado Yule marble resting on a floor of green marble. Yule marble is known for its pure white color and was used for both the Lincoln Memorial and the Tomb of the Unknown Soldier. In the narthex or vestibule, floors are slate and walls are marble. Elsewhere, the floors are terrazzo. The ceiling, in the same folded configuration as the exterior, is covered with a sprayed plaster for good acoustics. A tunnel connects the school to the church. In later years, the school was enlarged again and is now part of the Jordan School system, named in honor of Msgr. Jordan. In 1987 a new parish center was built behind the church and named Farrell Hall in honor of the first pastor who died in 1958. The rectory is now used as St. Anselm’s convent, while the original convent serves as both rectory and church offices. This article, by Diane Oestreich, is slightly modified from the original, which appeared in the Rock Island Argus and Moline Dispatch on June 6, 2004.